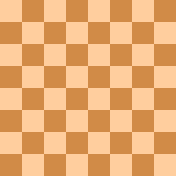 In chess, several checkmate patterns occur frequently, or are otherwise of such interest to scholars, so as to have acquired specific names in chess commentary. The diagrams that follow show these checkmates with White checkmating Black. In Anastasia's mate, a knight and rook team up to trap the opposing king between the side of the board on one side and a friendly piece on the other. This checkmate got its name from the novel Anastasia und das Schachspiel by Johann Jakob Wilhelm Heinse. In Anderssen's mate (named for Adolf Anderssen), the rook or queen is supported by a diagonally attacking piece such as a pawn or bishop as it checkmates the opposing king along the eighth rank. Sometimes a distinction is drawn between Anderssen's mate, where the rook is supported by a pawn (which itself is supported by another piece, as in the diagram), and Mayet's mate, where the rook is supported by a distant bishop. In the Arabian mate, the knight and the rook team up to trap the opposing king on a corner of the board. The rook sits on a square adjacent to the king both to prevent escape along the diagonal and to deliver checkmate while the knight sits two squares away diagonally from the king to prevent escape on the square next to the king and to protect the rook. There are two points to why the Arabian mate is both unique and significant: 1) It is mentioned in ancient Arabic manuscripts. 2) It is derived from the older Persian form of chess where the knight and the rook were the two most powerful pieces in the game. This was before chess had migrated to Europe and the queen was (later) given its current powers of movement. The back-rank mate occurs when a rook or queen checkmates a king that is blocked in by friendly pieces (usually pawns) on his first rank. The bishop and knight checkmate occurs when the king teams up with a bishop and knight to force the opponent king to the corner of the board. The bishop and knight endgame can be difficult to master: some positions may require up to 34 moves of perfect play before checkmate can be delivered. Blackburne's mate is named for Joseph Henry Blackburne and is a rare method of checkmating. The checkmate utilizes the black rook (it could be a bishop or queen instead) to confine the black king's escape to the f8-square. One of the bishops confines the black king's movement by operating at a distance, while the knight and the other bishop operate within close range. Threatening Blackburne's mate can be used to weaken Black's position. In Boden's mate two attacking bishops on criss-crossing diagonals deliver mate to a king obstructed by friendly pieces, usually a rook and a pawn. The Box mate is one of the four basic checkmates along with Queen mate, king and two bishops checkmate, and bishop and knight checkmate. It occurs when the side with the king and rook box in the bare king to the corner or edge of the board. The mate is delivered by the rook along the edge rank or file, and escape towards the centre of the board is blocked by the king. The Corner mate is a common method of checkmating. It works by confining the king to the corner using a rook or queen with a pawn blocking the final escape square and using a knight to engage the checkmate. After 1.Qh6+, Black is forced to play 1...Kg3. White then checkmates with 2.Qh2#. Cozio's mate is a common method of checkmating. It was named after a study by Carlo Cozio, published in 1766. Another name for this mate is Dovetail mate. It involves trapping the black king in the pattern shown. It does not matter how the queen is supported and it does not matter which type Black's other two pieces are so long as neither is an unpinned knight. See also Swallow's tail mate. Damiano's bishop mate is a classic method of checkmating. The checkmate utilizes a queen and bishop, where the bishop is used to support the queen and the queen is used to engage the checkmate. The checkmate is named after Pedro Damiano. Damiano's mate is a classic method of checkmating and one of the oldest. It works by confining the king with a pawn and using a queen to initiate the final blow. Damiano's mate is often arrived at by first sacrificing a rook on the h-file, then checking the king with the queen on the h-file, and then moving in for the mate. The checkmate was first published by Pedro Damiano in 1512. In Damiano's publication he failed to place the white king on the board which resulted in it not being entered into many chess databases due to their rejection of illegal positions. The David and Goliath mate is a common method of checkmating. Although the David and Goliath mate can take many forms, it is characterized generally as a mate in which a pawn is the final attacking piece and where enemy pawns are nearby. Its name is taken from the biblical account of David and Goliath. The Double bishop mate is a classic method of checkmating. It is similar to Boden's mate, but a bit simpler. The checkmate involves attacking the king using two bishops, resulting in the king being trapped behind a pawn that has not been moved. Epaulette or epaulet mate is, in its broadest definition, a checkmate where two parallel retreat squares for a checked king are occupied by its own pieces, preventing its escape. The most common Epaulette mate involves the king on its back rank, trapped between two rooks. The perceived visual similarity between the rooks and epaulettes, ornamental shoulder pieces worn on military uniforms, gives the checkmate its name. Van Wely–Morozevich, Wijk aan Zee 2001; Loek van Wely is forced to resign after blundering into an unavoidable Epaulette mate against Alexander Morozevich. Carlsen–Ernst, Wijk aan Zee 2004; a thirteen-year-old Magnus Carlsen achieves an unusual "sideways" Epaulette mate against Sipke Ernst on his way to winning the C Group at the Corus chess tournament in 2004. Anand–Carlsen, Tal Memorial Blitz World Championship 2009; when Carlsen essentially clinched the blitz world champion title. Greco's mate is a common method of checkmating. The checkmate is named after the famous Italian checkmate cataloguer Gioachino Greco. It works by using the bishop to contain the black king by use of the black g-pawn and subsequently using the queen or a rook to checkmate the king by moving it to the edge of the board. The h-file mate involves the use of a rook attacking the black king supported by a bishop. It often comes about after the black king castles on its kingside in a fianchetto position. White usually arrives at this position after a series of sacrifices on the h-file. Although it is called the h-file mate, it can also occur on other files, so for example with the uncastled black king on e8 and a white rook on d8 protected by a white bishop on g5. The Hook mate involves the use of a white rook, knight, and pawn along with one black pawn to limit the black king's escape. The rook is protected by the knight and the knight is protected by the pawn. The Kill Box mate is a box-shaped checkmate. The checkmate is delivered by the rook with the queen's assistance. The rook is adjacent to the king, the queen supports the rook by a separation of one empty square on the same diagonal as the rook. This forms a 3 by 3 box shape. The king could be on the edge of the board. Or, the king can be anywhere on the board, but the escape squares must be blocked off to prevent the escape of the king. King and two bishops checkmate is one of the four basic checkmates along with Queen mate, Rook mate, and the bishop and knight checkmate. It occurs when the king with two bishops force the bare king to the corner of the board to force a possible mate. In a two knights endgame, the side with the king and two knights cannot checkmate a bare king by force. This endgame should be a draw if the bare king plays correctly. A mate only occurs if the player with the bare king blunders. In some circumstances, if the side with the king also has a pawn, it is possible to set up this type of checkmate. In the Légal mate, two knights and a bishop coordinate to administer checkmate. Lolli's mate is a common method of checkmating. The checkmate involves infiltrating Black's fianchetto position using both a pawn and queen. The queen often gets to the h6-square by means of sacrifices on the h-file. It is named after Giambattista Lolli. Max Lange's mate is a common method of checkmating. The checkmate is named after Max Lange. It works by using the bishop and queen to checkmate the king. Morphy's mate is a common method of checkmating. It was named after Paul Morphy. It works by using the bishop to attack the black king and a rook and Black's own pawn to confine it. In many respects it is very similar to the Corner mate. The Opera mate is a common method of checkmating. It works by attacking the king on the back rank with a rook using a bishop to protect it. A pawn or other piece other than a knight of the enemy king's is used to restrict its movement. The checkmate was named after its implementation by Paul Morphy in 1858 at a game at the Paris opera against Duke Karl of Brunswick and Count Isouard; see Opera game. Pillsbury's mate is a common method of checkmating and is named for Harry Nelson Pillsbury. It works by attacking the king with either the rook or bishop as shown. The king can be either on the g8- or h8-square during the checkmate. Queen mate is one of the four major checkmates along with Box mate, king and two bishops checkmate, and bishop and knight checkmate. It occurs when the side with the king and queen force the bare king to the edge or corner of the board. The queen checkmates the bare king with the support of the allied king. Réti's mate is a famous method of checkmating. The checkmate is named after Richard Réti, who delivered it in an 11-move game against Savielly Tartakower in 1910 in Vienna. It works by trapping the enemy king with four of its own pieces that are situated on flight squares and then attacking it with a bishop that is protected by a rook or queen. Smothered mate is a common method of checkmating. It occurs when a knight checkmates a king that is smothered (surrounded) by his friendly pieces and he has nowhere to move nor is there any way to capture the knight. It is also known as Philidor's Legacy after François-André Danican Philidor, though its documentation predates Philidor by several hundred years. The Suffocation mate is a common method of checkmating. It works by using the knight to attack the enemy king and the bishop to confine the king's escape routes. Swallow's tail mate also known as the Guéridon mate is a common method of checkmating. It works by attacking the enemy king with a queen that is protected by a rook or other piece. The enemy king's own pieces (in this example, rooks) block its means of escape. It resembles the Epaulette mate. ^ The original "Anastasia's mate" appeared in: Wilhelm Heinse, Anastasia und das Schachspiel: Briefe aus Italien vom Verfasser des Ardinghello [Anastasia and Chess: Letters from Italy by the author of Ardinghello] (Frankfurt am Main, (Germany): Tarrentrapp und Wenner, 1803), volume 2, pages 211–213. The original "Anastasia's mate" is reproduced in modern notion with illustrations, in: Wilhelm Heinse, Anastasia und das Schachspiel … (Hamburg, Germany: Jens-Erik Rudolph Verlag, 2010), page 162, example 2. Note: Nowadays, "Anastasia's mate" refers to a mate in which the checkmated king is on an edge of the board or in a corner of the board, whereas in the original mate, the king was near the center of the board. ^ Renaud and Kahn (1962), p. 83. ^ "Famous Checkmates". Chess Lessons For Beginners. chesslessons4beginners.com. Retrieved 29 December 2013. ^ Renaud and Kahn (1962), p. 94. ^ Renaud and Kahn (1962), p. 89. ^ R. Schulder vs. Samuel Boden (London, 1853). ^ Renaud and Kahn (1962), p. 136. ^ Renaud and Kahn (1962), p. 46. ^ Renaud and Kahn (1962), p. 75. ^ Renaud and Kahn (1962), p. 142. ^ Renaud and Kahn (1962), p. 128. ^ Renaud and Kahn (1962), p. 35. ^ Sonja Musser Golladay (2007). Los Libros de Acedrex Dados E Tablas: Historical, Artistic and Metaphysical Dimensions of Alfonso X's "Book of Games". ProQuest. pp. 278–. ISBN 978-0-549-27434-6. ^ Renaud and Kahn (1962), p. 44. George Renaud and Victor Kahn, with W.J. Taylor, trans., The Art of Checkmate (Mineola, New York: Dover Publications, Inc., 1962; reprint of: New York, New York: Simon and Schuster, 1953). This page was last edited on 14 April 2019, at 19:27 (UTC).